Why aren't you reading this story on Samsung Galaxy S III? If you live in parts of Europe, the Middle East or Asia, arguably the hottest smartphone on the planet is selling out fast, and, whoa, it's not iPhone 4S. May 29 dawned on the continent to a new day for Samsung smartphones and sunset for Apple's flagship, which is oh-so similar to the one released in early 2010. Buyers looking for freedom from the walled garden or simply stunning software innovation can choose to "think different", borrowing the long-discarded Apple marketing phrase. Twenty-six days ago, I asked: "Is iPhone 4 obsolete?" Nearly 2,000 of you answered "Yes" -- that's 65 percent -- by saying you will buy Galaxy S III. Now remains the question: How many of you planning to buy, really will do so? Samsung unveiled its flagship smartphone on May 3, with plans to sell it through 297 carriers in 147 countries. The phone launched today in 28 countries. Americans can either order the Galaxy S III now, unlocked, or wait until it officially launches on these shores. Current rumors put the date in late June. Unlocked prices range form around $694 to $820, here. Samsung's Galaxy S III Pebble Blue version comes with a newly invented blue color and special hyperglaze material. In order to meet the highest internal quality standards and to provide the best quality Galaxy S III to customers, a short supply of Pebble Blue version is expected in some regions in the next 2-3 weeks. Samsung is working hard to ensure that customers will get the Pebble Blue colored devices as soon as possible. I sure hope you like white. Apparently some Pebble Blue models splotch. Is the S Before or After the Number Better? Galaxy S III: 4.8-inch Super AMOLED display (306 ppi) with 1280 x 720 resolution; 1.4GHz quad-core processor; 1GB RAM; 16GB or 32GB storage (64GB in future), expandable with microSD card; HSPA+ 21Mbps (850/900/1900/2100), 4G LTE, GSM/EDGE (850/900/1800/1900); 8-megapixel rear-facing and 1.9MP front-facing cameras; LED flash; zero shutter-lag; 1080p video recording; accelerometer; ambient-light sensor; gyroscope; GPS; proximity sensor; digital compass; NFC, Bluetooth 3.0; WiFi N; 2100 mAh battery; carrier locked; Android 4.0 and TouchWiz "nature" UI. Measurements: 136.6 x 70.6 x 8.6 mm, 133 grams. iPhone 4S: 3.5-inch multitouch display (326 ppi) with 960 x 640 resolution (800:1 contrast ratio); 1GHz dual-core processor; 512MB RAM; 16GB, 32GB or 64GB storage; UMTS/HSDPA/HSUPA (850, 900, 1900, 2100 MHz), GSM/EDGE (850, 900, 1800, 1900 MHz); 8MP rear-facing and VGA front-facing cameras; LED flash; image stabilization; 1080p video recording; accelerometer; ambient-light sensor; gyroscope; GPS; proximity sensor; digital compass; Bluetooth 4.0; WiFi N; 1432 mAh battery; carrier locked; iOS 5. Measurements: 115.2 x 58.6 x 9.3 mm, 140 grams. In many ways, Samsung out-Apples Apple. The original iPhone stood apart from all other phones, not just smart ones, for its humanness. Touch, and its intimacy, and the way the handset responded to your proximity gave it a human quality. Suddenly the phone wasn't an inanimate object but more living thing. Apple extended humanness with each new model. Samsung seeks to bring this quality to Galaxy S III, and it's centerpiece to the product marketing. Other than Siri, Apple did little to add humanness to iPhone 4S. Still, Siri provides personality and responsiveness for those people who use it. Samsung promises much more, by extending different sensors' functionality around stunning software enhancements. 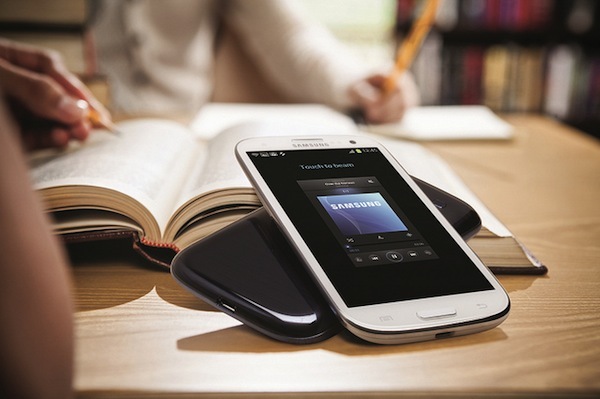 Galaxy S III responds to your movements, seemingly anticipating your needs. Front camera detects whether the user is looking at the phone and keeps the screen lit. How many times has your display gone dark while reading a website or ebook? The phone can automatically turn on, if recognizing your face. You're in the middle of texting someone and decide to call instead. Lifting the phone to your face places a call to the recipient. Facial recognition identifies friends, tagging their social networking accounts. Right, Facebook and Twitter. Voice commands are available in 8 languages. S Voice is the feature causing lots of excitement among Android users, so I ask: If you've used Siri and S Voice can you offer up some comparison in comments? Better: Email joe at betanews dot com, and I'll publish your comparative review with your name, photo and bio. Even better: I would love to publish your Galaxy S III review. We love reader-submitted reviews, and it would be an honor to publish yours.